Morelos ( moˈɾelos (help·info)), officially Free and Sovereign State of Morelos (Spanish: Estado Libre y Soberano de Morelos), is one of the 31 states which, with the Federal District, comprise the 32 Federal Entities ofMexico. It is divided in 33 municipalities and its capital city is Cuernavaca. It is located in South-Central Mexico. It is bordered by the states of Méxicoto the north-east and north-west, Puebla to the east and Guerrero to the southwest. Mexico City is situated north of Morelos. Morelos is the second-smallest state in the nation, just after Tlaxcala. It was part of the very large province then State of Mexico until 1869, whenBenito Juárez decreed that its territory would be separated and named in honor of José María Morelos y Pavón, who defended the city of Cuautlafrom royalist forces during the Mexican War of Independence. Most of the state enjoys a warm climate year-round, which is good for the raising ofsugar cane and other crops. Morelos has attracted visitors from the Valley of Mexico since Aztec times. Today, many people from Mexico City spend weekends in the state or own second homes there, especially in theCuernavaca area. The state is also known for the Chinelos, a type of costumed dancer that appears at festivals, especially Carnival, which is celebrated in a number of communities in the state. It is also home to the Monasteries on the slopes of Popocatépetl, a designated World Heritage Site. Evidence of the first human inhabitants in what is now Morelos dates back to 6000 BCE and shows these people as nomadic hunters and gatherers in the areas ofYautepec and Chimalacatlan. The first agriculturally based settlements appeared around 1500 BCE in Tamoachán. Other early finds include clay jars and figures in the Gaulupita neighborhood of Cuernavaca and three mounds in Santa María Ahuacatitlán, which are probably the remains of houses. The earliest identified culture is the Olmec, which was dominant from 200 BCE to about 500 CE. Evidence of this culture is found in reliefs such as those found in the Cantera Mountain in Chalcatzingo and clay figures. After the Olmec period, the area was invaded by several waves of migration from the Valley of Mexico in the north. The settlement of Mazatepec is founded in 603 by the Toltecs . A second wave of Toltecs established the city-state ofXochicalco (the City of Flowers). Their influence is evident in Teotihuacan at the temple of Quetzalcoatl, but there are also signs of Mayan, Mixtec and Zapotec influences. The last wave of Toltecs arrived in the 12th century. There are two groups from this wave. The first to arrive were the Xochimilcas, who settled in places such as Tetela, Hueyapan, Tepoztlán and Xumiltepec. Shortly afterwards the Tlahuicas arrived and has settled in an around Cuauhnáhuac or Cuernavaca by 1250. There is evidence that indicates the Tlauhuicas probably would have been expelled from Morelos by the Xochimilcas if they had not been protected by Xólotl, lord of Acolhua, who granted territory to Tochintecutli, the first lord of Cuauhnáhuac. The Tlahuicas are believed to be an offshoot of the Toltec-Chichimec group of Nahuatl-speaking peoples who have occupied the area since the seventh century. The Tlahuica eventually became the dominant ethnic group in Morelos. They were organized into about fifty small city-states each with a hereditary ruler (tlatoani). Each Tlahuica city-state consisted of a central town, with its temple, plaza, palace and the surrounding countryside and villages. The largest of these were Cuernavaca and Huaxtepec (now spelledOaxtepec). These people had advanced knowledge of astronomy and a highly developed agricultural system. They were especially known for growing cotton, which was planted wherever the land could be irrigated. Tlahuica women spun and wove cloth, which became an important item for exchange and for paying tribute. The Mexica or Aztec began to arrive in the area as early as 1398, but efforts to dominate this area began in the 1420s. In the 1420s and 1430s, Cuernavaca and Jiutepec were conquered by Itzcoatl. In the middle of the century, other city-states in Morelos made war on Aztec-held Cuernavaca and the Aztecs used this as an excuse to conquer areas such as Yautepec, Tetlama and other locations, eventually dominating the entire state. The inclusion of the area into the Aztec Empire was sealed with marriage of Aztec emperor Huitzilihuitl to Miahuaxochitl, daughter of the lord of Cuernavaca. This union produced a son who would become Aztec emperor Moctezuma Ilhuicamina. These conquered areas were allowed to keep their local political structures as long as tribute was regularly paid. This tribute mostly consisted of cotton items. The territory was divided into two tributary provinces, one centered on Cuernavaca and the other centered on Oaxtepec. Moctezuma Ilhuicamina succeeded Izcóatl, and tradition has it that he established a botanical garden in Oaxtepec. He also vacationed in the warm springs at the foothills of the Ajusco, located in what is now a resort run by the Social Security Administration (IMSS). Moctezuma’s favorite swimming area is thought to have been a nearby pond called “Poza Azul”. The Mexica built a number of fortifications in the area, notably in the hills called El Sobrerito and Tlatoani near Tlayacapan. The pyramid of Tepozteco (Tepoztlán) may have also been designed as a fort and lookout post. During this time, the Tlauhuica built the double-pyramid known as Teopanzolco in Cuernavaca. The economy of Morelos is based on agriculture, tourism and urbanization. Since the 1960s, the economy has been shifting from agriculture to industry and commerce. However, most of these shifts have occurred on a small scale and a number of municipalities are still almost completely reliant on agriculture. While the state provides just 1.6% of the country’s GDP, its economy is strong enough to attract workers, especially farm workers from other areas of the country. However, a large percentage of the state’s population works six days a week, receiving wages of only 500 to 700 Mexican pesos ($46–$65USD), despite the fact that Morelos is one of the more expensive states to live in. Economically, the state divides into seven districts. The Cuernavaca Region includes the municipalities of Cuernavaca, Temixco, Emiliano Zapata, Jiutepec and Xochitepec. The Norte Region includes the municipalities of Huitzilac, Tepoztlán, Tlalnepantla and Totolapan. The Cuautla Region includes the municipalities ofAtlatlahucan, Ayala, Cuautla, Tlayacapan, Yautepec and Yecapixtla. The Noreste Region includes Ocuituco, Temoac, Tetela del Volcán and Zacualpan de Amilpas. The Sureste Region includes Axochiapan, Jantetelco, Jonacatepec andTepalcingo. The Sur Region includes Amacuzac, Jojutla, Puente de Ixtla, Tlaltizapán, Tlaquiltenango and Zacatepec de Hidalgo and the Poniente Region includes Coatlán del Río, Mazatepec, Miacatlán and Tetecala . In 2003, it was one of the first states to take advantage of a new law allowing states to sell bonds. In 2002, the state sold $24 million USD worth of bonds on the Mexican stock market in order to finance highways, schools, waterworks and other infrastructure projects. The bond sales also allowed the state to access lower-interest long-term financing. Due to its location near Mexico City, the state has one of the lower rates of economic marginalization, ranking 20th of 33 units in economic marginialzation, based on housing and education. The most urbanized areas of the state are the strongest economically, with the least urbanized being the poorest. Two of the factors in the development of the state’s economy since the 1960s are the opening of the Mexico City-Acapulco highway through the state in 1952 and the creation of the CIVAC (Ciudad Industrial Valle de Cuernavaca) industrial complex in 1965. This concentrated the population growth into the northern part of the state. Only eleven of the states 33 municicpalities are considered to have any serious degree of marginalization: Tlalnepantla, Totolapan, Tlayacapan, Tetela del Volcán, Ocuituco, Zaculapan, Temoac, Tepalcingo, Amacuzac, Coatlán del Río, Miacatlán and some parts of Puente de Ixtla. Since the 1980s, the agricultural sector of the economy has been steadily shrinking but it remains an important part of the state’s economy, as there are still a significant number of communities that rely on it. Just under 20% of the working population of the state is involved in farming, ranching, fish farming or forestry. Land available for human exploitation outside of populated areas is divided between agriculture/grazing (45%) and forestry (55%). Agricultural and forestry lands are further subdivided by climate and the type of forest (conifer vs. rainforest). Roughly 70% of the state has a subtropical climate, providing ideal conditions for agriculture, in particular sugar cane, and most farming is done in the warmer areas. Sugar cane has been an important crop since colonial times and still is important today, although the percentage of land dedicated to it has decreased since the 1960s. Another important crop is rice. The production of rice in the state has fallen drastically, from a height of 100,000 tons annually to only 21,000 tons due to the reduction in cultivation areas and the high costs of production. The state still ranks sixth in its production. However, despite price and market protections, foreign rice is competing with Mexican grown rice, including rice produced in the state. Sorghum has replaced lost yields of sugar cane and rice to a certain extent, which has been encouraged by the government. One way the state tries to sell its more expensive products such as rice has been the registration of a trademark called “Tradicion Agricola de Morelos” (Morelos Agricultural Tradition) to identify products produced in the state on store shelves. Another important cash and export crop is fresh flowers and ornamental plants. In 2003, this sector accounted for 27 million dollars of income to the state, up from 20 million in 2000. Morelos is Mexico’s major producers of roses, producing 54,552 dozens in 2002.Morelos claims to be the native location of the poinsettia, called “noche buena” in Spanish. It is native to Mexico, but there has been a “diplomatic patent” on the plant since the early 19th century when the first US ambassador to Mexico, Joel Roberts Poinsett, registered it. The state’s historical society has asked the Secretary of the Interior to review treaties and work to have this patent annulled. As it stands now, Mexican poinsettia growers must pay royalty fees to the U.S. and even import cuttings from authorized growers in the U.S. to grow the plant commercially. Another effort to combat the patent is to develop a new variety of the flower that would not be covered. Along with corn and beans grown for subsistence, other fruits and vegetables are widely grown. These include bananas,cherimoyas, mameys, melons, cucumbers, tomatillos, jicama, squash, alfalfa, cotton, peanuts, onions and tomatoes. Many crops are grown for autoconsumption, especially in indigenous areas. The state is working to help shift agriculture production from the traditional corn and beans, which can be imported cheaper, to other products such as apricots, which have been shown to make money. Livestock mostly consists of cattle, pigs, horses and domestic fowl. There is some fish farming in the state, mostly of mojarra and tilapia in Rodeo and Zacatepec. Industry, mining and construction accounts for 29% of the state’s GDP and employs 27% of the working population. Food processing (especially sugar came, rice,sorghum and grains) represents an important industry. Goods produced include automobiles and auto parts, textiles, pharmaceuticals, metal products, agro-industry, ceramics and handcrafted items. Most exports go to the United States, Canada, Japan and the European Union .In the early 2000s, the state attracted a number of foreign enterprises to build industrial facilities here, includes car parts such as windshields. There are two major industrial parks in the state, Ciudad Industrial del Valle de Cuernavaca (CIVAC) and Parque Industrial de Cuautla (PINC) . CIVAC is located in the municipality of Jiutepec. It was created in 1966 and is considered to be the most important economic development in the state. Today the park is home to 108 businesses, 35% of which are transnational. The Parque Industrial de Cuautla is located outside of the city. It occupies 113 hectares, with about 40% of this available. The industrial park suffered major fire damage in 2007. In 2009, the government intervened with plans to revive the park and improve its infrastructure with a budget of 240 millionpesos. Commerce, transportation, services and tourism accounts for 59% of the state’s GDP and employs just over 50% of the working population.] The growth of the commerce sector is due to urbanization and the growth of tourism. The biggest selling point of the state touristically is its location, just south of Mexico City, which has the largest and wealthiest population in the country. Many of these people come to spend the weekend in Cuernavaca’s nightclubs and away from Mexico City’s traffic and pollution. Many of these visitors have bought second homes here, which has driven property prices up. 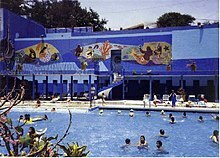 Those from Mexico City and other cities are also attracted to the states water parks and spas, such as Las Palmas in Tehuixtla, El Rollo and the Parque Acuatico Oaxtepec. The state, especially around the capital of Cuernavaca, has experienced a housing boom since the late 1990s. More than 10,000 houses were built from 2000 to 2008 and another 50,000 are planned through 2013. The state’s office of urban development states that this is far above what is needed to house the state’s population. Instead, it reflects demand from Mexico City for weekend and getaway homes. The housing boom has put strain on infrastructure and on property prices. The Secretary of Tourism for the state promotes the cities of Cuernavaca, Tepotzlán, Tlayacapan, Xochicalco, Cuautla and Tequesquitengo. As the center of the state’s history and culture, the city of Cuernavaca has landmarks and attractions such as the Palacio de Cortés, the Morelos and Juárez Gardens, the Cuernavaca Cathedral, and the Borda Garden. The various Spanish language schools in Cuernavaca also attract foreign students, many from the United States. Tepotzlán is another area that many people from Mexico City visit during the weekends. Tepotzlan is a “New Age” town famous for its pyramids and “revitalizing energy.” It was named a “Pueblo Mágico” in 2002. It is home to one of theMonasteries on the slopes of Popocatépetl, a World Heritage Site. Tlayacapan is located in the northeast part of the state, just south of Mexico City. It is a rural area, with a way of life that has not changed much over the 20th century. Ninety percent of its population is still partially or fully dependent on agriculture. The town has old mansions, houses with red tile roofs and streets paved with stones. Many ravines crisscross the area and are crossed by numerous stone bridges. 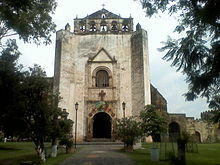 It is also home to the San Juan Bautista Monastery and 26 chapels built in the colonial era. Cuautla is the second largest city in the state and was the site of one of the early major battle of the Mexican War of Independence. The center of the town is home to the Municipal Palace and the Santo Domingo Church. One major attraction is the Morelos House, where José María Morelos y Pavon lived. Near the city are various spas and waters parks such as the Agua Hedionda, famous for its foul-smelling sulfur-laden waters. The original town of is now located under Lake Tequesquitengo, which was created when the area was flooded by damming the local river. Only the bell tower of the town church is visible. The lake is 3 km by 4.5 km and is used by visitors for watersports and weekend getaways. The state has a number of archeological sites, the largest and most important of which is Xochicalco. It was founded by Mayan traders known as the Olmeca-Xicallanca, later inhabited by the Tlahuica and designated as a World Heritage Site. 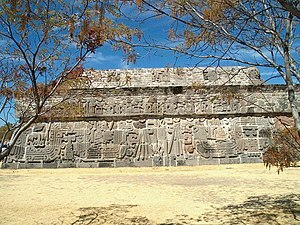 Its best known structure is the Temple of Quetzalcoatl . The site ofTeopanzolco is within the city of Cuernavaca. It was a ceremonial center of the Tlahuicas, which was modified in the 15th century by the Mexicas. The site has large plazas and circular buildings. The most important temple is the Twin Temples (Templos Gemelos), similar to the Templo Mayor in Mexico City. Tepozteco is located on a mountain ridge 600 meters over the town of Tepotzlán. It was built between 1150 and 1350 CE and dedicated to Ometochtli-Tepoxtécatl, the god ofpulque, fertility and harvests. Today, the mountain area in which it is located is the El Tepozteco National Park, which was established in 1937. The Monasteries on the slopes of Popocatépetl is a World Heritage Site that consists of fourteen monasteries south and east of Mexico City. Most are in the state of Morelos, with three in the state of Puebla. The monasteries in Morelos are located in the municipalities of Atlatlahucan, Cuernavaca, Tetela del Volcán,Yautepec, Ocuituco, Tepoztlán, Tlayacapan, Totolapan, Yecapixtla and Zacualpan de Amilpas. The three in Puebla are located in Calpan, Huejotzingo and Tochimilco. The state promotes the monasteries as the “Route of the Monasteries” or the “Route of the Volcano.” Most, but not all, of these monasteries are located on the periphery of the Popocatepetl volcano. This area also has varying landscapes, a wide variety of flora and fauna as well as churches, former haciendas, archeological sites and ruins.